How will I stay RELEVANT as an artist? I’ve seen this one before, thought I’d made peace with it. But it looked different this time because now it found me in my new role as a mother. It had only ever known me before as a dedicated artist. Now, it approached a woman who was questioning her degree of dedication. I imagined an extreme scenario, ten years into the future: My career has left me behind because I’d spent the last ten years solely focused on family and raising children. I’m no longer creating IMPORTANT work and whatever I’d made before has become outdated. My skills have become rusty. My colleagues have forgotten me. My industry no longer cares. I am irRELEVANT. If I don’t stay RELEVANT, how will I face all the people who’d been my competition all those years? If I don’t stay RELEVANT, how will I face my mentors who’d written me letters of reference for serious pursuits of theatrical academia? If I don’t stay RELEVANT, how will I justify all those hours of work and study? If I don’t stay RELEVANT, will I still be an artist? Wallowing—I’d found a name for what I’d been doing that night. After reading the above, I found my ego cowering in the corner, shamed by the bigger issues that had just entered the room. I shut myself up and I went to sleep. If I can let go of the to-impress, to-please, to-satisfy parts of being an artist, what is left is just the GIVING part. Glennon’s post reminded me that GIVING is BEING RELEVANT. A: I’ll know what to GIVE by listening closely for what is needed from me. B: The only thing that is required of me is to respond. C: If I do so with truth, love, and energy, I will stay RELEVANT. 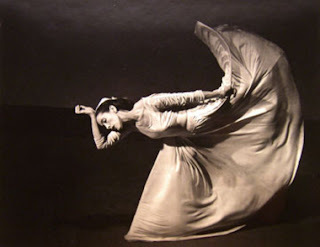 I first read the excerpt from Martha Graham's letter here. Your emotionally naked story has triggered a plethora of memories of similar inner debates and reconciliations between what my life could/should be and what it was/is. I'm inspired by your and Glennon's practice of using a blog to help organize, distill and publish your life's learnings. Bravo!!! I applaud you!